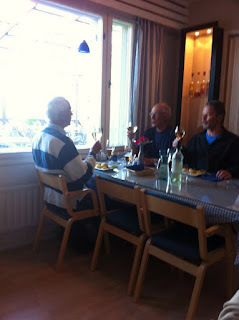 On Friday, the last but one day of our week-long holiday to the Åland Islands we joined my family to celebrate a 75th Birthday by visiting a remote island restaurant, The Glada Laxen, near Kumlinge in Bärö. This restaurant belongs to a number of establishments listed in The Best of the Archipelago guide, so we had high expectations. The weather was sunny and warm - not as hot as it had been in Finland over the summer - but it was perfect weather for a spot of island hopping. We began the journey from our base on the island, Lemland, by driving Northeast via Bommarsund to Prästö, where a small cable ferry took us over the water and to another island, Vårdö, where we picked up a larger car ferry. These car ferries criss-cross the archipelago, with a schedule that 'You need a masters degree in to understand' (comment by locally born and raised birthday boy). All the same as a foot passenger you pay nothing. We left our two cars behind in the deserted car park at Vårdö so all of us could enjoy a drink. Onboard the ferry there was a bar and the hour's or so trip to Enklinge went quickly while we admired the scenery (which I never tire of) and toasted our 75-year-old youngster. The car ferry dropping us off at Enklinge. Inside the ferry isn't exactly luxurious, but its clean and roomy. Once the ship dropped us off on the island of Enklinge, we did feel a little abandoned, but were soon picked up by the friendly owner of the Glada Laxen restaurant, Henrik. I could quite easily live here...though the commute to London might be a little tricky. Onboard Henrik's motorboat we were quickly whisked off to Bärö, a former Finnish coastal guard station. The braver of us climbed the now redundant guard tower, an experience they said they'd rather not repeat. The top viewing platform had a slatted floor. Because I was still recovering from my op, I stayed put on the sunny but windy terrace and began to study the menu at Glada Laxen. I decided to have the 'Archipelago bread' with a seafood röra - a mixture of prawns, whitefish roe, gravad lax, dill and soured cream. The other dishes around the table looked equally delicious. Archipelago tapas including whitefish roe, dill marinated herring and smoked salmon. En route from Enklinge our host had picked up some fresh abborre (pike perch) fillets prepared by his fisherman friend on a nearby island (we were in the deepest darkest Åland archipelago). Henrik prepared this local fish simply for our main course by covering the fillets thinly with rye flour and frying them in butter. With a cold herb sauce of soured cream, tasty new potatoes, lettuce and tomatoes from his own vegetable garden, this was one of the best traditionally cooked abborre I've ever had in Åland. Just a note to save my neck here - nothing beats abborre caught and smoked by the birthday boy in Lemland. Although it says something that he too loved this dish - and he's a man who very rarely orders fish in a restaurant. The other main course chosen by our party was lamb raised by Henrik himself. 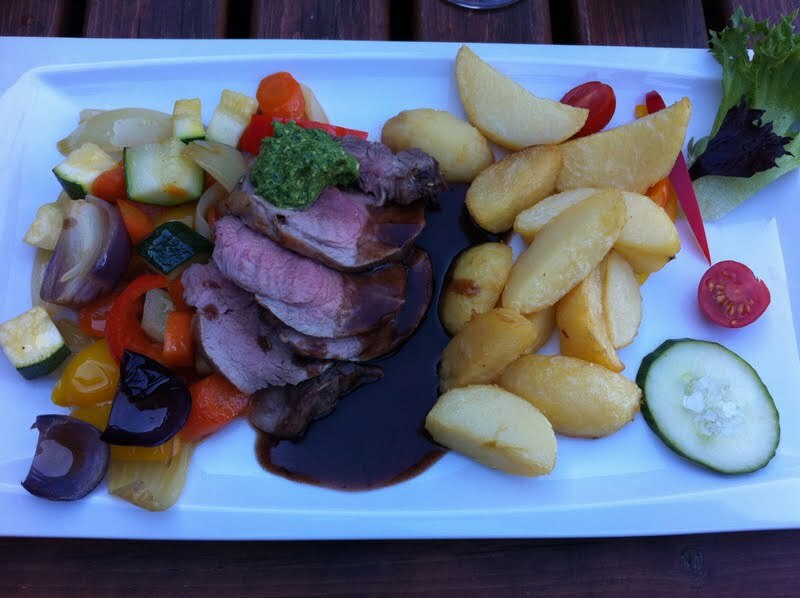 I don't eat lamb - one of the few things I don't like - but according to the Englishman it was delicious. For pudding we had yet another traditional local dish: Ålands pannkaka. The Åland pancake was served with whipped cream and lightly stewed blueberries. About half way through our meal we were joined in the otherwise empty restaurant by three sailors. They were in good voice, singing schnapps songs. When they found out the cause for our celebration, they promptly got up and sang 'Ja må han leva' - the birthday song in Swedish. After we'd chatted about the food for a bit, we suddenly realised we had acquaintances in common. One of the sailors had also studied at the same university as I did (although a good few years before me) and we knew some of the same tutors. 'It's a small world,' commented the Swedish speaking Finn from Helsinki. 'Or a small archipelago,' I thought. Henrik delivering us back to Enklinge to catch the last ferry of the day back to Vårdö. The position in the middle of the beautiful Åland archipelago and the clean, fresh taste of the food at Glada Laxen receive top marks from me. Also the food wasn't over salted, as is often the case nowadays in Finland and Sweden. However, I was a little disappointed in the surroundings: the terrace had seen better days. In a top restaurant people expect high quality furnishings as well as good food. White plastic flower pots and mis-matching, chipped chairs won't do. The dining room inside too needed some investment; there were paper napkins, the glass-topped tables were easy to clean, I'm sure, but wouldn't inspire a picky customer. The menu was good, short and not too pricey; but the cost at the end was the same one would pay in Mariehamn, Stockholm or Helsinki. Would I visit Glada Laxen again? If I was sailing past, yes, if nothing but for the friendly, all-accomodating service and the excellent, fresh fish. Looks like your vacation in Åland Islands was very worthwhile. I hope I can visit that place someday too.